Geneva (VNA) – Head of the National Assembly's ​External Relations Committee Nguyen Van Giau said as the law-making body, parliaments play the key role in promoting and ensuring human rights. 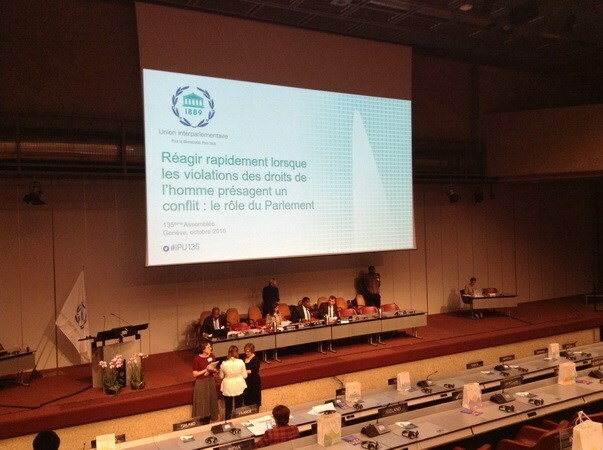 At the ongoing 135th General Assembly of the Inter-Parliamentary Union (IPU) in Geneva, Switzerland, Giau stressed that parliaments should continuously refine laws, supervise Governments’ implementation of laws and listen to opinions and feedback from the public. Addressing the debate “Human rights abuses as precursors of conflicts: Parliaments as early responders”, the Vietnamese representative stressed that ensuring human rights is Vietnam’s consistent policy since the country’s founding, adding that the country is willing to share its experience in the field. Over the past years, the Vietnamese NA has undertaken efforts to improve the system of laws on human rights, including the promulgation of the 2013 Constitution with new contents related to human rights and basic rights of citizens, in accordance with standards stipulated in international conventions on human rights, Giau said. The NA has also ratified multiple international conventions on human right, and played an important role in ensuring the compatibility between domestic laws and international conventions, to which Vietnam is a member. Giau noted that performing its supervisory role, the Vietnamese NA timely detects wrongdoings across the fields, thus preventing violations of human rights and ensuring a peaceful and favourable environment for its people. Therefore, there are no violent conflicts in Vietnam, including those stemming from human rights violation, Giau said, adding that thanks to strong efforts of the NA, the Government and the people, Vietnam has maintained a stable economic growth, thus improving living conditions, reducing poverty rate while promoting social equality and ensuring increasing enjoyment of socio-economic rights of vulnerable groups. The Vietnamese representative underlined the country’s viewpoint that human rights can only be ensured in a peaceful and security environment on the basis of respect for law. He called on the IPU to continue promoting international, regional cooperation and dialogues among nations on protecting human rights. During the one-week meeting, over 700 delegates from 138 nations shared the view that ensuring human rights is one of the key tasks of all nations in the world. They stressed that in order to prevent the spread of crisis, it is fundamental to eliminate the root causes, one of which is the violation of human rights. Based on the common understanding, participants discussed measures to promote and ensure human rights, prevent risks of violent conflicts and enhance the leadership role of women. Other issues put on the table during the meeting include the role of parliaments in preventing outsiders’ interference in sovereign nations’ internal issues, and promotion of international cooperation in the framework of Sustainable Development Goals.